This lesson reviews the common types of triangles in geometry. Triangles are three-sided shapes that lie in one plane. Triangles can be classified according to the size of its angles. Some examples are right triangles, acute triangles and obtuse triangles. The lengths of the sides of triangles is another common classification for types of triangles. Some examples are equilateral triangles, isosceles triangles and scalene triangles. The following figures show the different types of triangles. Scroll down the page if you need more explanations and examples of each type of triangle and how to solve problems involving them. A right triangle is a triangle with a right angle (i.e. 90°). You may have noticed that the side opposite the right angle is always the triangle's longest side. It is called the hypotenuse of the triangle. The other two sides are called the legs. The lengths of the sides of a right triangle are related by the Pythagorean Theorem. There are also special right triangles. Example 1: A right triangle has one other angle that is 35°. What is the size of the third angle? Step 1:A right triangle has one angle = 90°. Sum of known angles is 90° + 35° = 125°. An acute triangle is a triangle whose angles are all acute (i.e. less than 90°). In the acute triangle shown below, a, b and c are all acute angles. Example 1: A triangle has angles 46°, 63° and 71°. What type of triangle is this? Answer: Since all its angles are less than 90°, it is an acute triangle. Example 1: Is it possible for a triangle to have more than one obtuse angle? Step 1: Let the angles of the triangle be a, b and c. Let a be the obtuse angle. Step 2: The sum of all the angles in any triangle is 180°. a + b + c = 180°. If a > 90° then b + c must be less than 90°. Therefore, b and c must be acute angles. Answer: No, a triangle can only have one obtuse angle. An oblique triangle is any triangle that is NOT a right triangle. Acute triangles and obtuse triangles are oblique triangles. 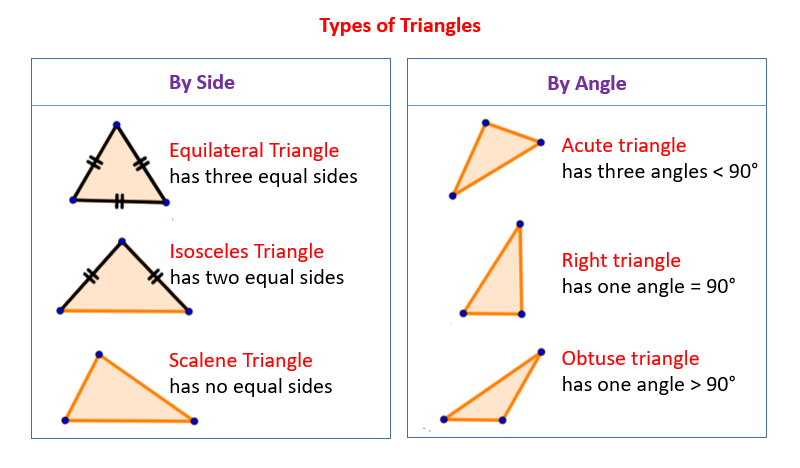 Besides classifying types of triangles according to the size of its angles as above: right triangles, acute triangles and obtuse triangles; types of triangles can also be classified according to the length of its sides. Some examples are equilateral triangles, isosceles triangles and scalene triangles. An equilateral triangle has all three sides equal in length. Its three angles are also equal and they are each 60°. An equilateral triangle is also an equiangular triangle since all its angles are equal. Example 1: An equilateral triangle has one side that measures 5 in. What is the size of the angle opposite that side? Step 1: Since it is an equilateral triangle all its angles would be 60°. The size of the angle does not depend on the length of the side. Answer: The size of the angle is 60°. An isosceles triangle has two sides of equal length. The angles opposite the equal sides are also equal. Example 1: An isosceles triangle has one angle of 96°. What are the sizes of the other two angles? Step 1: Since it is an isosceles triangle it will have two equal angles. The given 96° angle cannot be one of the equal pair because a triangle cannot have two obtuse angles. (Refer to obtuse triangle above). Example 2: A right triangle has one other angle that is 45°. Besides being right triangle what type of triangle is this? Step 1: Since it is right triangle it will have one 90° angle. The other angle is given as 45°. Step 2: Let x be third angle. The sum of all the angles in any triangle is 180°. Step 3: Two of the angles are equal which means that it is an isosceles triangle. Answer: It is also an isosceles triangle. We've looked at classifying types of triangles according to the size of its angles: right triangles, acute triangles and obtuse triangles; and also covered types of triangles according to the length of its sides: equilateral triangles, isosceles triangles and scalene triangles. We can also name triangles according to both their angles and sides. Triangle classifications - scalene, isosceles, equilateral, acute, obtuse, right, and equiangular.